If you want to change your lifestyle, new routines are very important. A daily routine has the ability to help break bad habits. Think about it — if you get yourself into a bunch of good habits, and they become your new “day to day-thing,” then it doesn’t leave much room for your old, bad habits. And instead of trying to avoid bad habits, its easier to start to create new ones. Stick to your new daily routine, and bad habits will be naturally eradicated from your life. Or does that sound too easy? You are not a great cook, so you will never persist, don’t waste any time on this! You look great, why would you change your lifestyle? People will think you are mad…. Do you want to become someone who’s always counting calories and eating salads? And these are just a few that went through my head. Do you recognize one or more? Don’t take them too seriously, because some of them might be true right now, but you can overcome them. That’s were a new (daily) routine kicks in. It may sound too good to be true, but it’s really as easy as deciding what matters to you, and then making a schedule that revolves around those things. I have many new routines now, some on weekly basis, some on a daily basis. Some only take 5 minutes a day, like the next one. 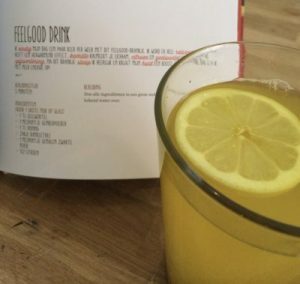 Inspired by a recipe from the book ‘Power food” by Rens Kroes I turned a relaxing-drink into a more or less daily routine. Before going to bed I treat myself on a cup of Turmeric Tea. Turmeric (or curcumin, in Dutch: kurkuma) is arguably the most powerful herb on the planet at fighting and potentially reversing disease. It has so many healing properties and it acts as an antioxidant and anti-inflammatory agent. And you can make a great tea out of it! Combined with the other ingredients mentioned in the book of Rens, all together you have a relaxing cup of tea. Which will guarantee you a good night’s sleep! Combine the turmeric, black pepper, ginger, honey, the chamomile tea bag and the lemon juice in a large mug and add enough boiling water to fill the mug. The ginger will warm you up, the chamomile has a calming effect and the lemon and turmeric aid digestion. This drink is healthy and really delicious. Enjoy and feel free to share your routines and recipes! PS Turmeric is best absorbed by the body when it is consumed in combination with black pepper. So, if you had in mind skipping this ‘strange’ ingredient for a tea, just don’t, as it will diminish the health effect. Which would be a pity.